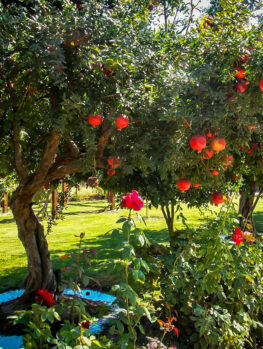 The Wonderful Pomegranate is a small tree from 15 to 25 feet tall that thrives in hot, dry conditions and can be grown anywhere winter temperatures are above 100F. It will grow in most soils and established trees need no additional watering or special care, so this is an excellent low-maintenance tree for warmer states. It can be grown as a specimen or planted in a row as a barrier or a hedge. The fruits ripen in early winter and can be used for juice, eaten fresh or as an addition to salads of all kinds. They are a popular ingredient in Middle Eastern cooking. The Wonderful Pomegranate is very long-lived and easy to care for and is attractive all year round with its green and glossy leaves, it brilliant red flowers, its large red fruits and the picturesque nature of its bark and branches in winter. Even if your winters are too cold to grow this tree outdoors, it makes a great container tree – just keep it inside during the coldest periods. The choices for trees that will thrive in dry areas can be limited. If you want a tree that will not only grow but produce useful fruit, the choices are even more limited. 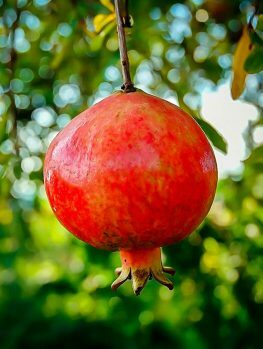 However there is one tree that really fits those requirements and that is the Wonderful Pomegranate. This tree is very drought tolerant, unlike most fruit trees that need plenty of water. If you live in a dry area, the Wonderful Pomegranate is an easy, low-maintenance choice that is very attractive both in flower and in fruit. The tree quickly develops a mature appearance and makes a great companion for Olive Trees, as they both enjoy hot, dry summers and give a lot of character to a dry garden without needing much care. Pomegranates have been enjoying a revival lately and their juice has become a supermarket staple. The fresh seeds turn up in recipes and the health benefits of this unusual and tasty fruit are often described. So to have your own tree and pick large, tree-ripened fruits that will store for many weeks is a great treat and makes the Wonderful Pomegranate a very worthwhile addition to the garden. 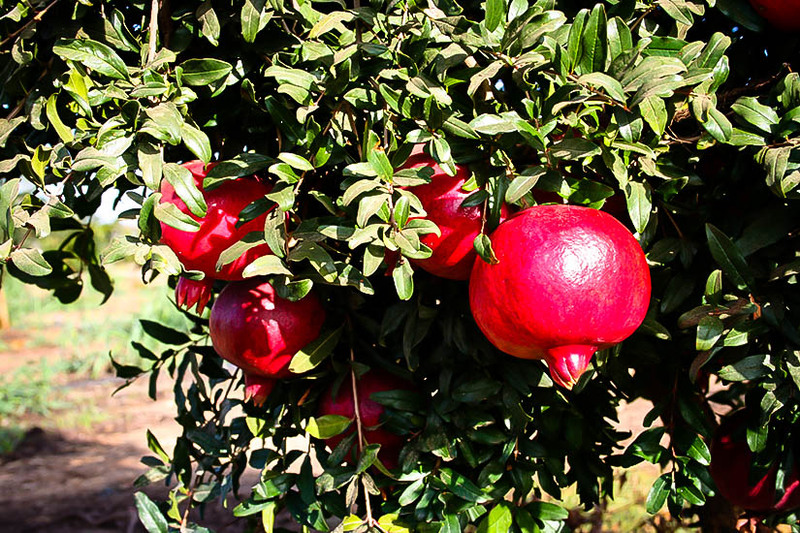 The Wonderful Pomegranate is a special form of the common pomegranate tree that is notable for its large fruits, vigorous growth and reliable cropping. It is especially adapted to hot regions. To preserve these special properties it must be reproduced the correct way, from stems of properly identified trees. Avoid cheaper seedling trees that will be unreliable and will not have the special qualities of the Wonderful Pomegranate. 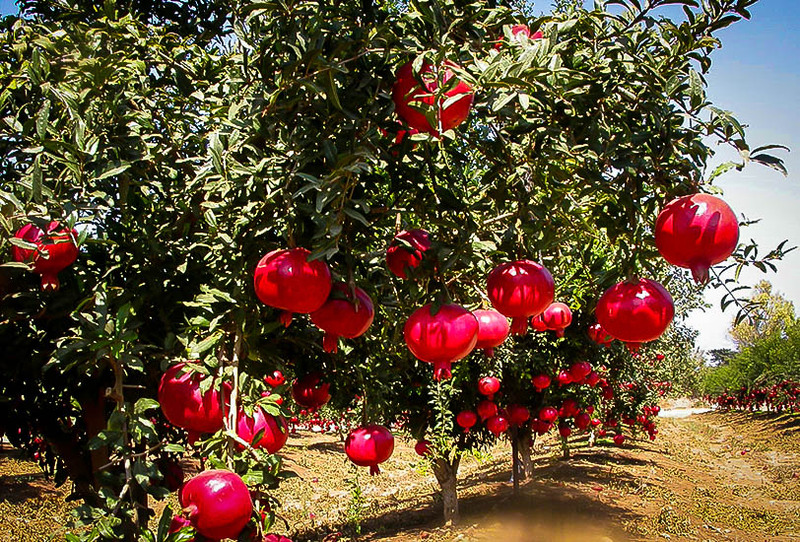 The Wonderful Pomegranate grows best in areas with hot summers and cool but not cold winters. It will survive temperatures as low as 100F, meaning it will grow from zone 8 to zone 10, so throughout Florida and the South, in most of Texas and all up the West coast, these attractive trees can be grown in gardens. They are resistant to most pests and diseases and are generally resistant to deer because of their spiny stems. Pomegranates can be used as specimens in the garden or planted to make a screen. They can even be clipped into hedges and with their spiny stems they make an excellent security barrier. They live for many, many years and become more picturesque as they age. Large trees can be cut back and will re-sprout, becoming bushy again and looking lovely with their thick grey trunks topped with dense foliage. A tree can also be planted in a large container and will grow and fruit for many years. Just keep your tree outside in a sunny spot and bring it indoors while temperatures are below freezing. Keep it in as cool a place as possible during that time and keep the soil on the dry side. This tree thrives on poor, dry, rocky soil where many other plants will not grow and it makes a great choice for hot, dry exposed locations. The only soil it will not thrive in is soil that is often wet. A single tree should be given at least 10 feet of room from buildings or other plants. For a screen space the trees 6 feet apart and for a hedge 3 or 4 feet apart. A hedge should be clipped once a year only, immediately after the fruits have been picked. More frequent clipping will reduce flowering and fruit production. 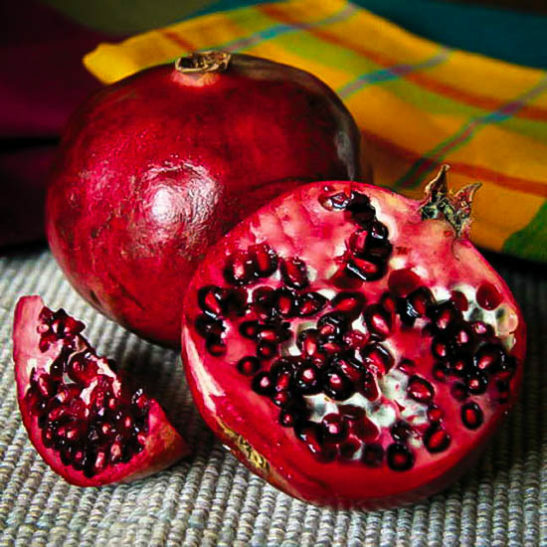 The Pomegranate, Punica granatum, has been grown for centuries in the Middle East, where the juice in particular is very popular. It is an excellent source of vitamin C and is packed full of anti-oxidants too. It is a small tree or large shrub, growing 15 to 20 feet tall, with a dark grey rough bark that gives even young trees a lot of mature character. The small leaves are glossy, dark green, simple in shape and always attractive. In colder areas the leaves are deciduous but in warm regions they may remain evergreen. The flowers are large, up to an inch across, and they are bright red and very showy. They have a leathery base from which the flower emerges, and this base becomes the bottom of the fruit. The fruits are large, perhaps 5 inches across or even more and they are bright red when ripe. They take around six months to mature, so after the tree flowers in spring the fruits are ready by early winter, making them a traditional Christmas treat in many countries. Fruit is ready to pick when it makes a hollow sound when tapped. Inside the leathery skin of the fruit are hundreds of seeds, each surrounded by the pink, juicy flesh. These seeds can be removed from the skin and eaten, scattered on salads or other dishes, or put through a juicer to extract the delicious juice they contain. This is tangy and refreshing and can be drunk fresh, sweetened or not, or used as an ingredient is such things as salad dressings and sauces.